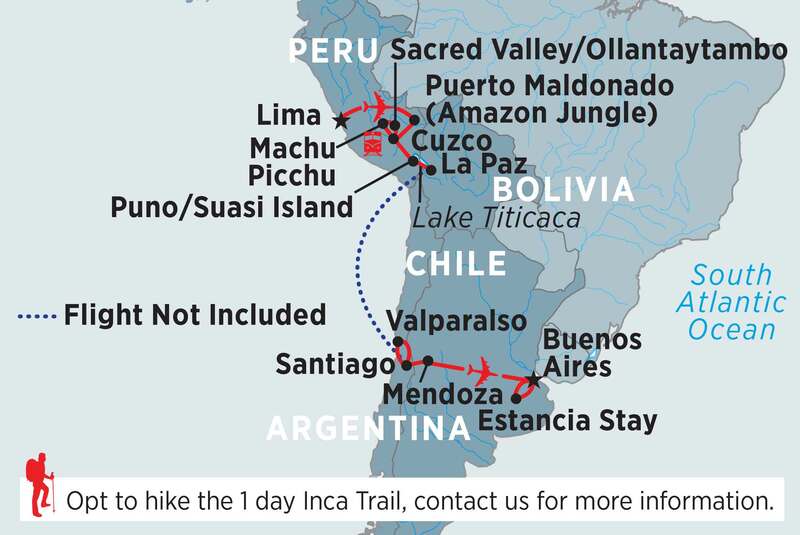 Packed full of highlights, this journey showcases the diversity of wonders across the Andes and Amazon. At Cusco, in the Peruvian Andes, be immersed in the ancient culture of the Incas, visit the Sacred Valley and revel in the magnificent citadel ruins of Machu Picchu. At Lake Titicaca, visit the floating Uros Islands before continuing to the lofty heights of La Paz. Discover the Chilean capital of Santiago and Mendoza, home to some of Chile’s most famous wineries, and spend a night at a traditonal Argentinean estancia before finishing the adventure in Buenos Aires.